While many people are turning to the cloud for storage these days, not everyone trusts such a thing. After all, when you upload your files to an online server, you are essentially storing your stuff on someone else's computer. If you prefer complete control over your data, local storage devices are superior. What if you want to leverage a USB flash drive, but you need better performance? In that case, a product such as the rugged Pocket SSD from VisionTek should meet your needs. These popular devices look like a standard flash drive, but they are much faster. Today, VisionTek launches the next generation -- the XT Pocket SSD. Not only is the top capacity now a massive 1TB, but the drive should last longer too. You see, VisionTek claims special data refresh technology will allow it to last more than 171 years before failing. In other words, it will outlive you! "The next generation of VisionTek USB 3.0 Pocket SSDs combines a sleek portable design and ultra-fast read/write demands, all without compromising large capacity requirements. 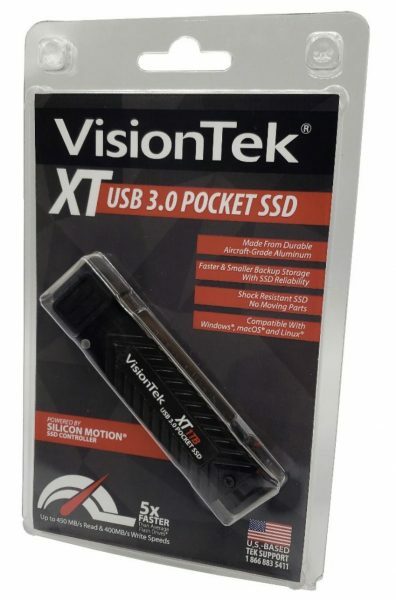 The VisionTek XT USB 3.0 Pocket SSD can be plugged into any computer’s USB 3.0 port to save or share work files, movies, images, music libraries, and more. The speed, reliability, and storage capacity of the VisionTek XT USB 3.0 Pocket SSD rivals internal SSDs, exceeds standard USB flash drive speeds, and demolishes the read/write speeds of external hard disk drives. They can be used with nearly any Windows, Mac OS X, and Linux based system with a USB 3.0/2.0 interface," says VisionTek. The company further says, "The Legacy continues with the next generation of VisionTek XT USB 3.0 Pocket SSD. The New XT version is similar in size to a standard USB thumb drive, but that’s where the comparison ends. The aircraft-grade aluminum housing contains a fully functional Solid-State Drive with a multi-chip design utilizing high endurance Tier1 3D NAND powered by the Silicon Motion 2258XT controller. Providing industry-leading bandwidth up to 451MB/sec transfers, the XT USB can approach the maximum limits of the USB 3.0 5Gb/s interface on large transfers. This design makes it possible for file transfers to and from the VisionTek XT USB 3.0 Pocket SSD to be done 5 times faster than standard HDD external hard disk drives." VisionTek shares the following features and benefits. Mark Bilson, Executive Vice President of VisionTek provides the following statement. Launching the next generation Pocket SSD in faster XT versions was a priority for us. We improved the SMI controller across the entire line and added a larger capacity 1TB version. IT professionals and PC enthusiast with larger storage capacity needs will take full advantage of this design. 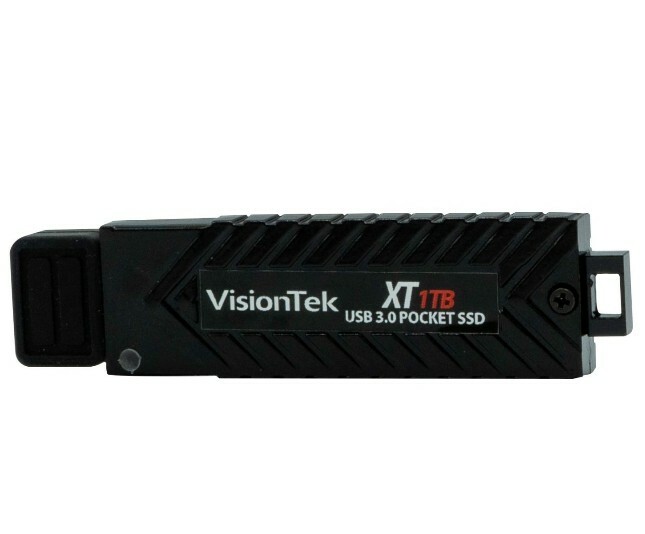 The VisionTek XT Pocket SSD can be had immediately from the company directly. The 120GB variant is $69.99, while the 250GB model is $119.99. The 500GB SSD is $199, and the drool-worthy 1TB drive is $329. If you want to buy your own, please use the below links.